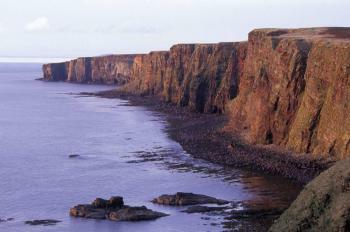 The John O'Gtroat Trail is a 147 mile coastal walking route from Inverness to John O’Groats, traversing shorelines, cliff tops, back lanes and footpaths of the Scottish Highlands. The route is a work in progress. Some of it is only accessible to the most fit and adventurous of walkers. Other sections are already popular walks. See stage status pages on the John OGroat Trail web site. The walk is meant to be used both by long-distance walkers going as far as to or from Land’s End, and local walkers looking for a coastal stroll. Accommodation, meals and shops are available at the end of most stages of the walk.